09 Jul It’s Monarch Month! 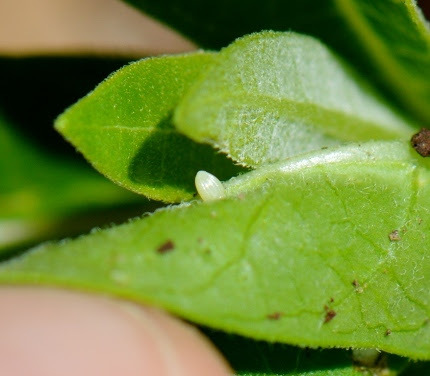 Learn how to find these tiny monarch caterpillar eggs on milkweed plants. Summertime is here in all its glory and education is something we are passionate about. At Natureworks, we have proclaimed July to beMonarch Month. Jillian Shea, our very creative Natureworker, came up with the fabulous Mildred the Monarch educational sign shown above to help all of us understand about the different types of Asclepias that monarch caterpillars can feed on. There is a Grow Organic Kids event on Thursday called Monarch Fun with a couple of spots left. If you want your young ones to understand all about monarchs, sign them up. With the 4th of July behind us, it’s time to get into some serious summertime fun and some important summertime garden care. This Thursday night we will stay open a bit later so that I can offer a free garden walk to demonstrate how to deadhead, cut back, and feed your perennials and roses in July. This is SO important. With the onset of heat and humidity, some of your plants may be looking a little tired. We have a cure for that! I spent so much time over the long holiday weekend in my own gardens and they look SO much better- less crowded, more organized, and popping with lots of freshly planted color. 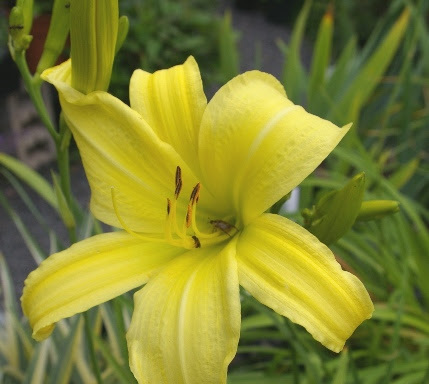 Hemerocallis citrina is a daylily with vespertine flower. We have a few of this rare species on our benches now. It opens in the evening and emits a powerful fragrance. I have this right near my deck at home where I sit and relax after dinner. Daylily season is upon us! A very unusual new Shasta daisy named ‘Real Neat’. 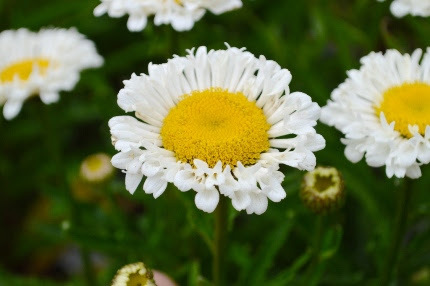 With a compact habit and frilly petals, it is perfect for the foreground of the summer garden. I cut down my old-fashioned bleeding heart and added some tall zinnias. I open pruned my roses and fed them. I “cut windows” for plants that were crowding each other out. My reward? Besides a sense of satisfaction that I am gaining a grip on my gardens at last, I was able to pick colanders filled with blueberries and raspberries. I ate my first early tomato, a couple of young zucchinis, tons of snap peas, and salad greens with fresh herbs. Then I simply sat back and watched with wonder as the birds, hummingbirds, and butterflies enjoyed my beautiful gardens and containers. 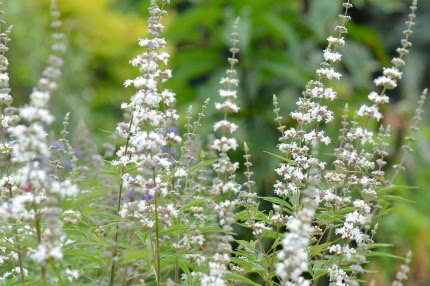 White Vitex loves the heat, is totally deer proof, cools down the look of the summer garden. We have SO many really interesting plants on our benches right now. Daisies of all sorts are classic summer blossoms, beloved by bees and butterflies. Our summery, cool white Vitex plants are in full bloom after just barely missing being destroyed by the truck that landed on our front lawn last Thursday, knocking down the telephone pole and smashing many of our gardens. Never a dull moment at Natureworks! Heliopsis ‘Asahi’ is back in stock. This is one of the longest bloomingperennials I have ever met. It is one of the only tidy, compact Heliopsis varieties we offer, topping out at only 2′ tall with double gold flowers that look like marigolds. Got blueberries? We do and they are on sale for the next two weeks. In fact, ALL FRUIT PLANTS are 20% off. We have so many different kinds. 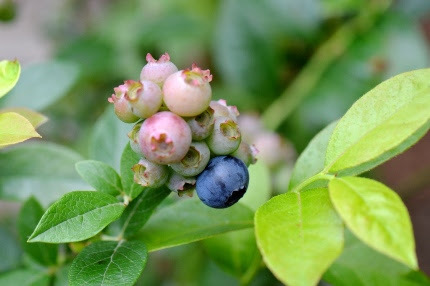 Although my first attempt ever at blueberry pie was not the most successful, I am thrilled to be eating fresh fruit from my garden every day and even more thrilled that Diane decided to put all fruit plants on sale for the next two weeks. 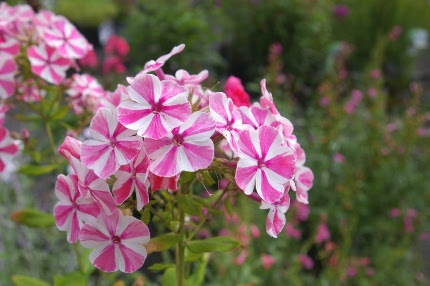 The other plant going on sale is Phlox paniculata and we’ve got amazing colors to chose from this year! On the right is an absolute beauty, ‘Peppermint Stick’. We also have some organic fertilizers and an organic fungus control spray on sale. Pottery is on sale too. 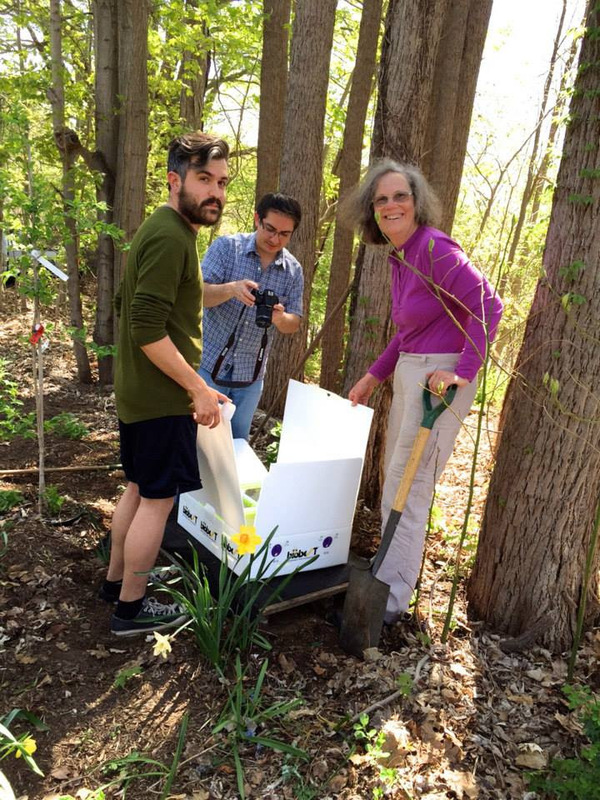 Dr. Kimberly Stoner and her assistants working with the pod of bumblebees we had at Natureworks. Next week I am super psyched to host my friend Dr. Kimberly Stoner, entomologist from the CT Agricultural Experiment Station (and long time N.O.F.A./CT board member) here at Natureworks for a very important discussion of the state of our bees and pollinators. Kim is a dedicated organic gardener and scientist and has been doing a lot of research about the crisis that we are facing with the decline in our pollinators. You have surely heard about the controversy concerning neonicotinoids in pesticides. Kim is working with nurseries and landcare professionals to do scientific studies on this subject. This summer Natureworks played host to a pod of bumblebees which were part of her work. Eat food? You need bees of all sorts. Don’t miss this opportunity to learn from one of the most respected entomologists in our state. See the Calendar of Events below for all of the details about this and all of our events.